Abraham Lincoln grew from a boy into a man in what is now called Lincoln City, Indiana. While his birthplace in Kentucky and his role as a Senator from Illinois gets much recognition- Indiana is often overlooked. Until researching the area around Evansville, Indiana; did I even know that Lincoln spent nearly 15 years of his life in Indiana! 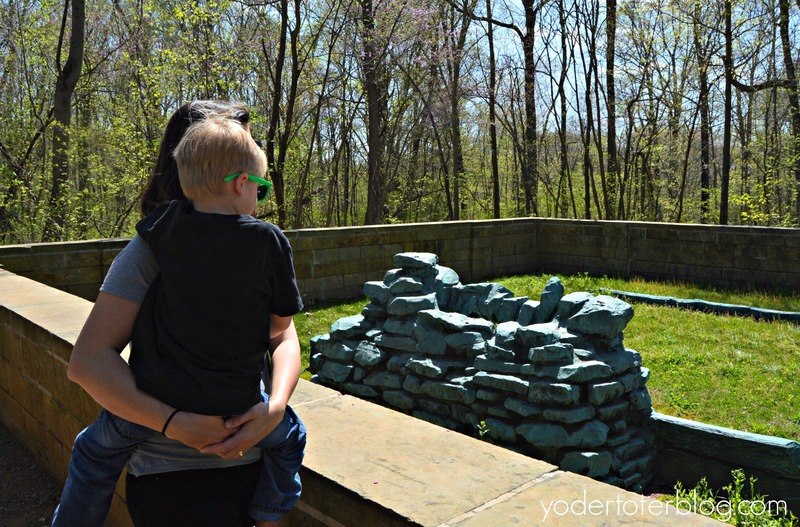 Our visit to the Lincoln Boyhood Home helped me to better understand our 16th President. 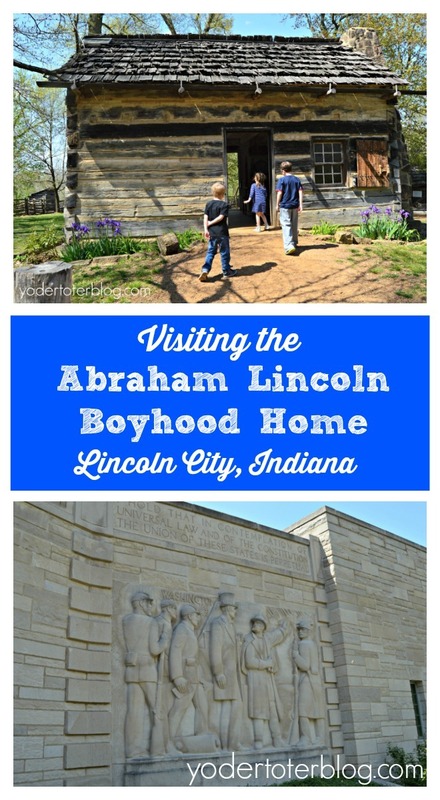 What we thought to be a 20-minute to Lincoln’s Boyhood Home turned into 2 HOURS of learning about Honest Abe’s life, family, and farm. 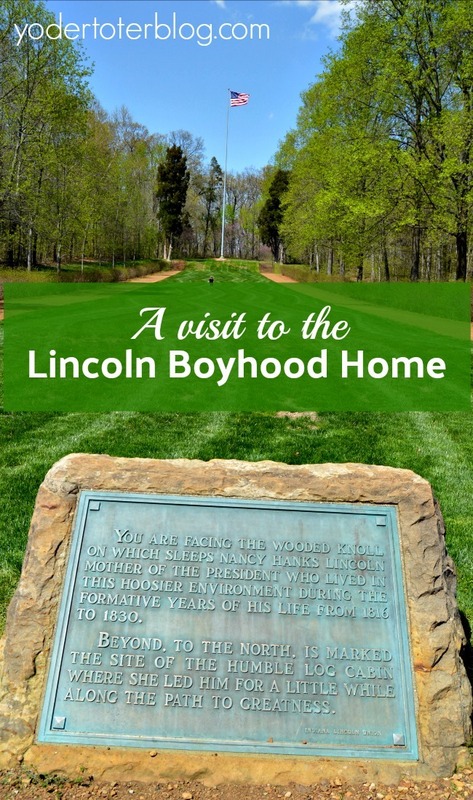 The Lincoln Boyhood Home is a multi-site Memorial. You’ll want to leave plenty of time to visit the Museum, Grave of Nancy Hanks Lincoln, and the replica 1820s homestead. 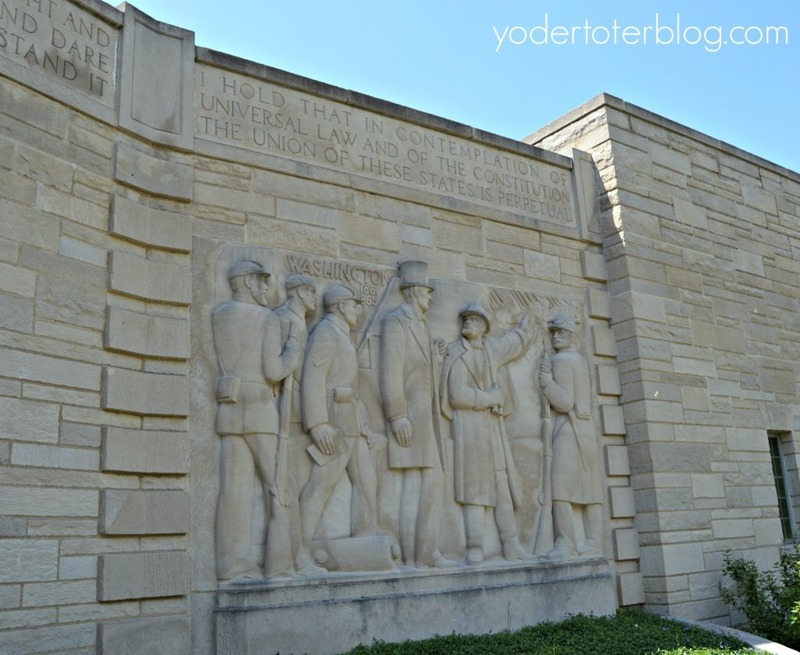 Arriving at the Lincoln Boyhood Site, the first thing you will notice is the outside of the Memorial Building is designed with stonework depicting the life of Abraham Lincoln. There are 5 panels showing the following themes: His birthplace in Kentucky, his boyhood days in Indiana, his years of political work in Illinois, his years as President, and his death. Pictured above is the “Washington Panel” showing Abe Lincoln as President. Lincoln is with President Ulysses S. Grant and soldiers. Inside the Memorial is a museum with artifacts from Lincoln’s life and displays showing how his time in Indiana affected the rest of his life. 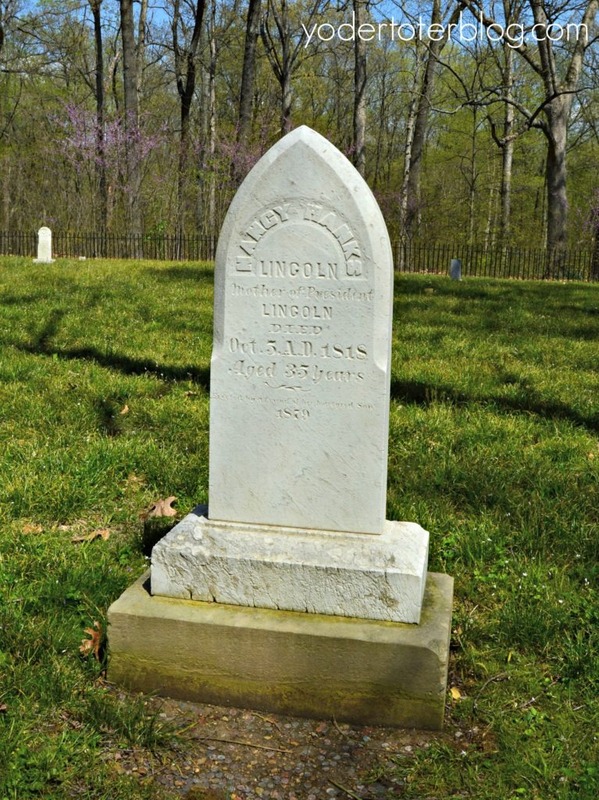 The saddest event was the sudden passing of Lincoln’s Mom, Nancy Hanks Lincoln. She passed away in Indiana when Lincoln was 9. Nancy Lincoln died from “Milk sickness.” She drank the milk from a cow that had eaten white snakeroot. At the time, no one knew what caused this sickness and it eventually became the reason why so many settlers moved on from Southern Indiana. Now we can identify the disease and can treat with glucose. Across from the Lincoln Memorial and Museum are the flag and lawn. (Fun fact: this is the largest flagpole in the National Park System). A trail from this area leads to the Nancy Hanks Lincoln gravesite. The most emotional part of seeing her grave, for me, was the pennies that were laid at her monument. Mrs. Lincoln didn’t get to see the man whom Abraham became, yet it’s certain that she played a role in his character. From Nancy’s burial site, visitors can walk .5 mile trail to the cabin and working farm or walk back to their cars and drive to the area. We chose driving since our son had a broken foot. The Cabin Site memorial is believed to be the excavated site of the 3rd Lincoln cabin. A bronze mold was laid over the area of the foundation & hearth. The best part for young families is seeing the living historical farm. 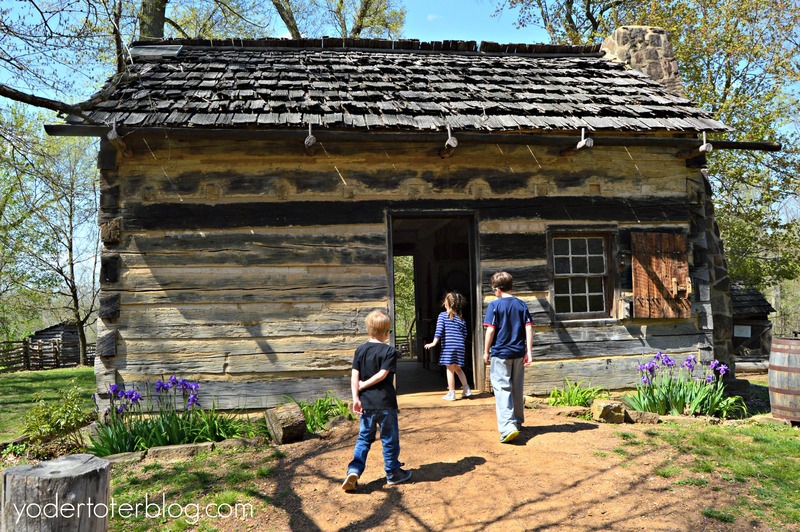 Visitors have a chance to see a cabin similar to what Abe Lincoln grew up! We met some outstanding volunteers who work the land and shear the sheep and even spin the wool. The volunteers are self-taught on how to live as settlers would have in 1820. Throughout the year are special exhibits. The day we visited, Clydesdale horses were plowing the nearby field. Note: the farm is only open mid-April through late September. The rest of the year you can walk around the buildings, but you won’t be able to enter or speak with volunteers. Restrooms are available in the museum. The cabin/farm area has some picnic tables and drop-toilets. You’ll need to carry away your trash. Lincoln City, Indiana is easily accessible from I-64. It is located less than 10 minutes from the interstate. If you’re looking for other things to do in Southern Indiana- don’t miss Evansville! It’s only 45-minutes away! Our family learned so much during our visit to the Lincoln Boyhood Home. I’d highly recommend a visit for anyone interested in American history! Nice article Leah. I always loved taking our kids to places like this – now soon it will be grandkids!